BEIJING (Sputnik) — Thousands of doves and multicolored balloons have been released into the air above Tiananmen Square where the Thursday military parade took place. Leaders and high-ranking officials from almost 50 countries, including Russian President Vladimir Putin, arrived in the Chinese capital for the celebrations. However, a number of leaders, including Japan's Prime Minister Shinzo Abe rejected the invitations. 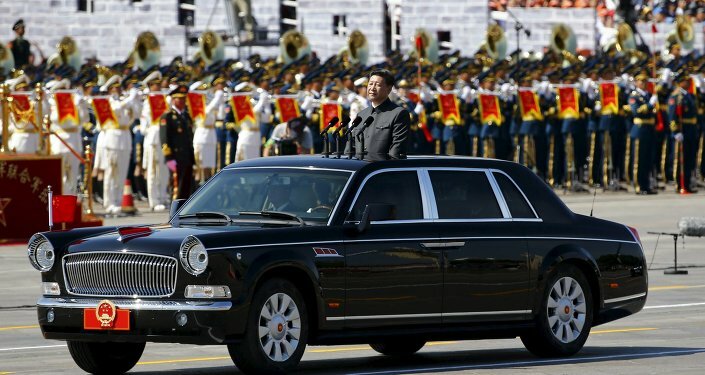 During the parade, Chinese President Xi Jinping, also the commander of the armed forces, announced that the number of Chinese troops would be cut by 300,000, as China remains committed to peace. Currently, the Chinese military forces, the largest in the world, currently include over two million servicemen. According to official sources, about 12,000 servicemen, mostly Chinese, took part in the Beijing parade, including 11 infantry phalanxes, a mechanized convoy of 27 formations and ten echelons of aviation. Some 200 aircraft, 500 military vehicles, as well as various tanks and missiles were on display during the event, demonstrating China's military might.